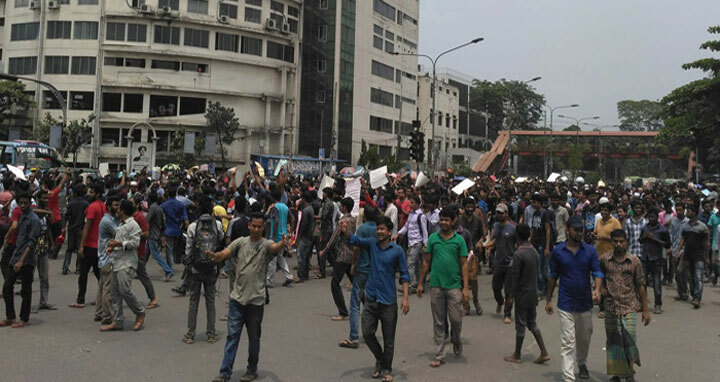 Dhaka, 14 May, Abnews: An indefinite class and examination boycott programme at colleges and universities across the country is underway as the government failed to publish a gazette abolishing the quota system in government jobs by the timeframe given by quota protestors. Several hundred of students of Dhaka University have been staging demonstrations on the campus boycotting their classes and examinations. Quota protesters at Chittagong University started their sit-in programme around 7am and stopped shuttle train service at Sholoshahar number 2 gate area around 8:00am. Earlier, the quota protesters gave the government an ultimatum to publish a gazette abolishing quota system in government jobs as per the Prime Minister’s announcement by Sunday afternoon and threatened to go on indefinite strike from Monday.